An aerial campus view from the 1950s. 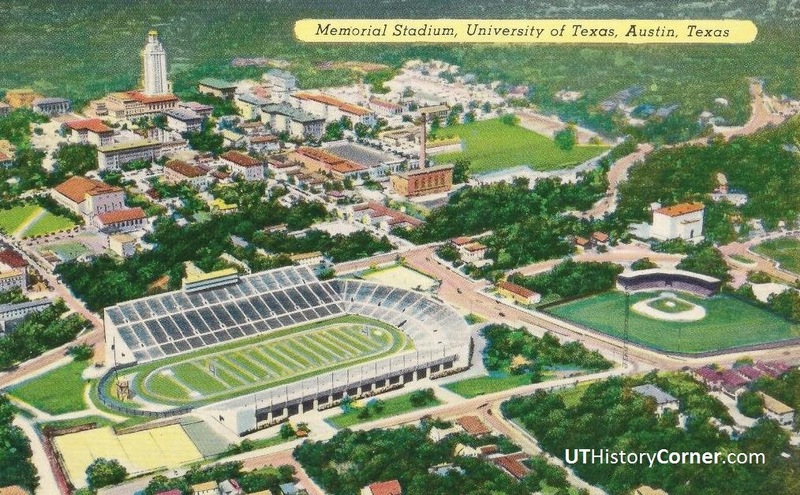 To the right of the stadium is Clark Field at its second location (the third and current version of Clark Field is beside the San Jacinto Residence Hall), used by the UT baseball team. The East Mall would not be developed until 1960. The Main Building in the late 1950s. The statue of George Washington, created by Italian-born artist Pompeo Coppini (who also sculpted the Littlefield Fountain and statues along the South Mall), was a gift of the Daughters of the American Revolution and unveiled on the campus in 1955. 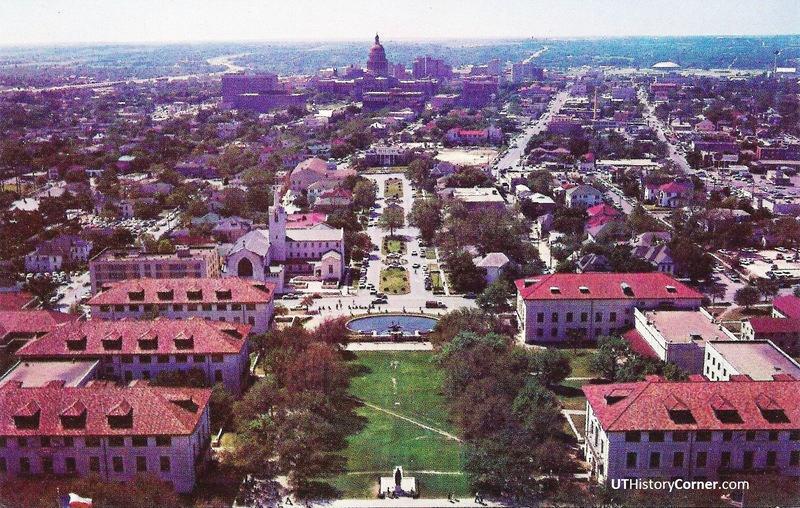 A view from the UT Tower observation deck around 1960. The six familiar buildings along the South Mall are not yet complete. 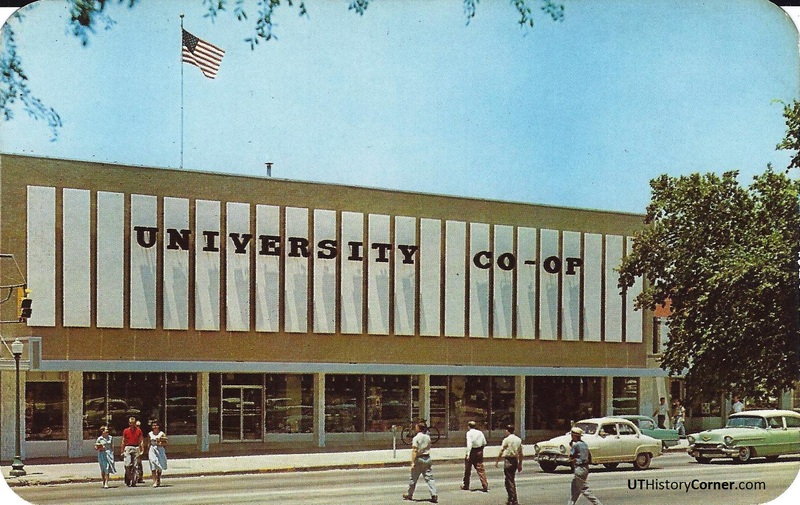 (Calhoun Hall wasn’t added until 1968.) Off in the distance to the right is the dome of newly-opened Palmer Auditorium at Auditorium Shores, which is now the Long Center for the Performing Arts. 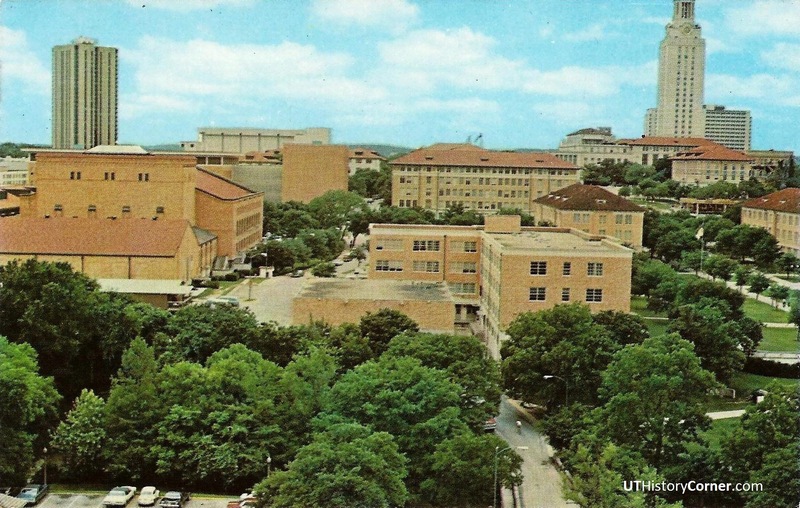 A north view from the UT Tower observation deck, in the mid-1950s. Look north, beyond the rectangular courtyard of what were initially women’s residence halls. (The lower three are now co-ed, while the top, the Alice Littlefield dormitory, is still reserved for freshmen women.) The yellow-bricked house at the north end of an open space belonged to Episcopal Bishop George Kinsolving. 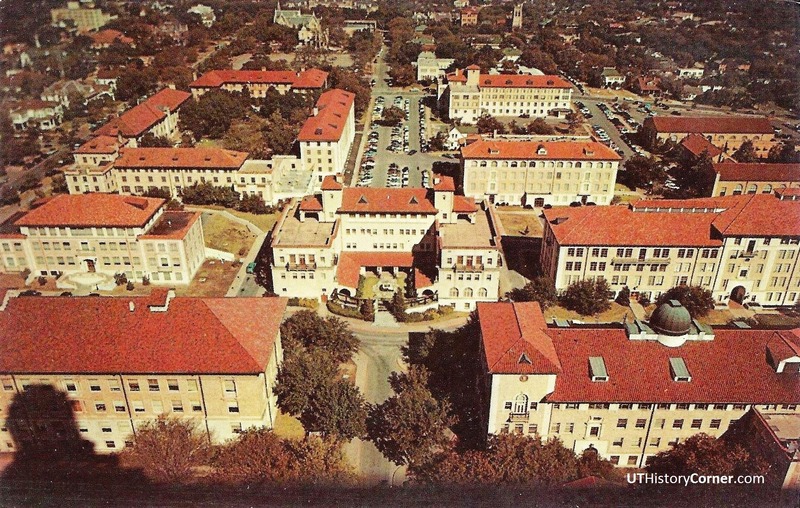 The land was obtained by the University and Kinsolving Residence Hall for women opened in 1958. 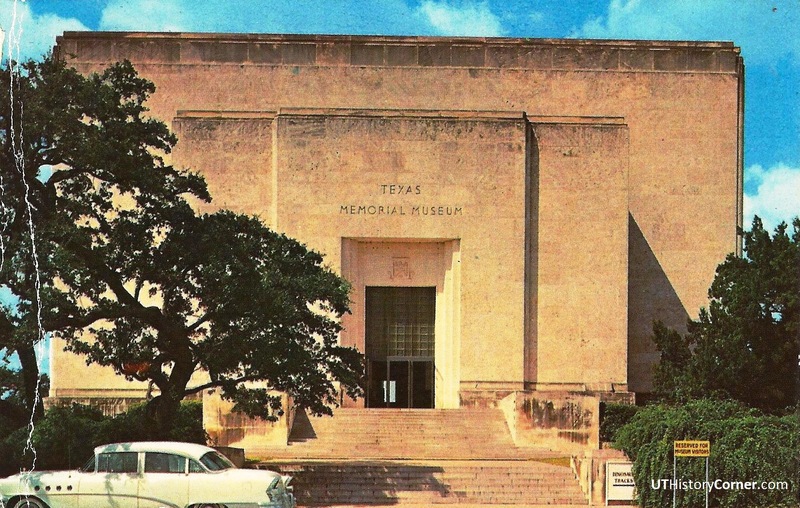 The Texas memorial Museum: Construction began in 1936 as a part of the Texas Centennial celebration. President Franklin Roosevelt, during a short visit to Austin, set off the dynamite that was a part of the ground breaking ceremony. The museum opened three years later, and now houses the Texas Natural Sciences Center. A history of the museum can be found on the Center’s web site here. 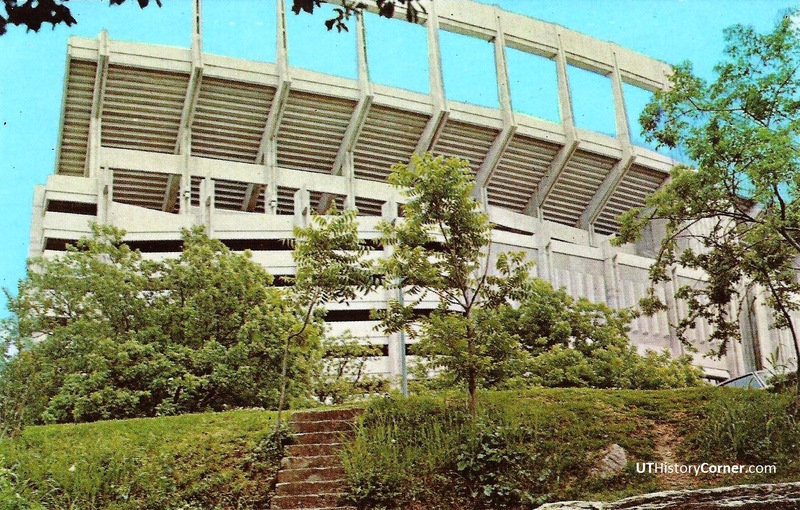 A photo of the campus from the hill just east of the stadium, taken in the early 1960s. For decades, the traditional start time for football games was 2 p.m. on Saturday afternoons. 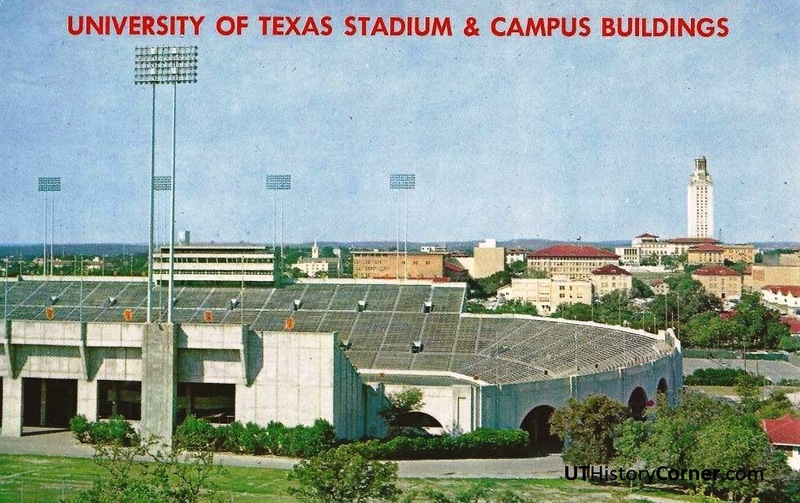 Lights were added in 1955, and the first night game was held on September 17, 1955, against Texas Tech. The Lila B. Etter Alumni Center was opened in 1964. 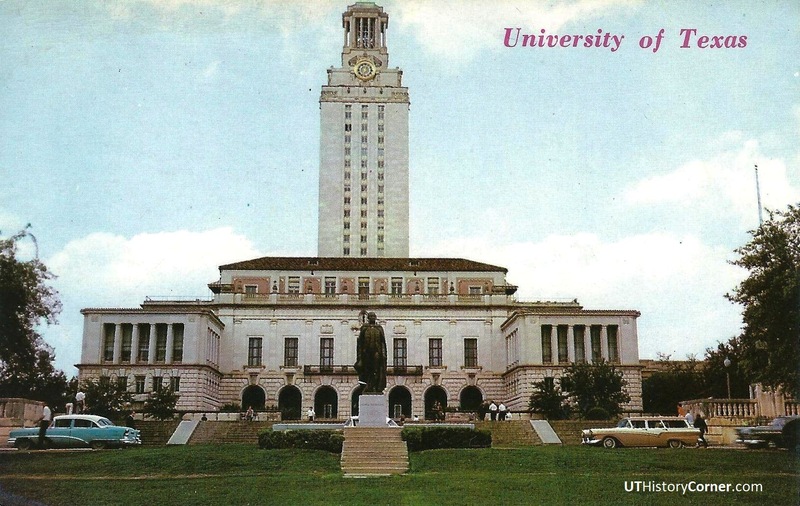 The alumni association had first been housed in room 47 in the old Main Building, but moved to west campus in the 1920s, then into the Texas Union when it opened in 1933. When the association needed more office space in the 1950s, the Littlefield Home was considered as a possible alumni house. Instead, a new building was constructed across the street from he stadium. 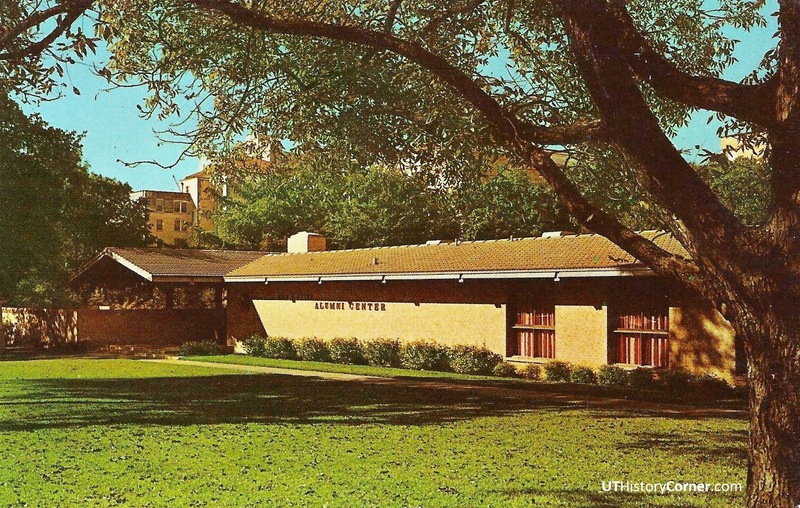 Jester Center was opened in 1969 and was intended to be a residential college, complete with classrooms, a two-story dining facility, and a lecture hall/theater inside the building. 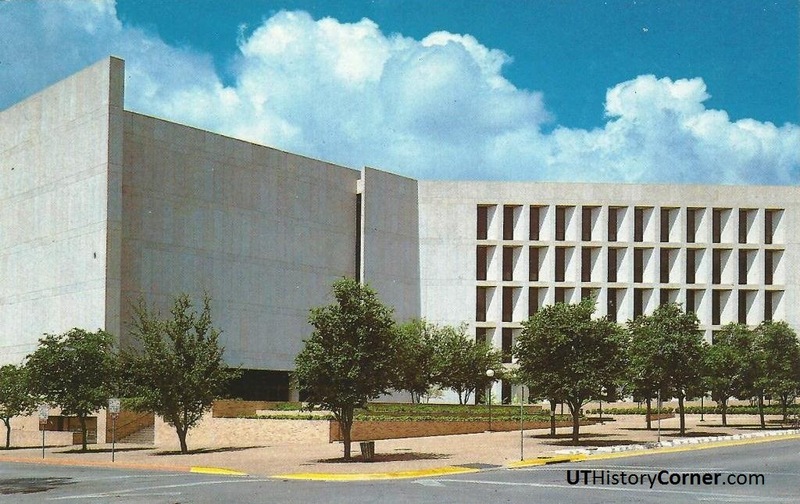 Designed to house almost 3,000 students, the original plans called for two buildings: Jester West to be women only, and for Jester East to house men (which is why room numbers in the east building still begin with “M” instead of “E.”) For two decades, Jester Center claimed its own zip code. 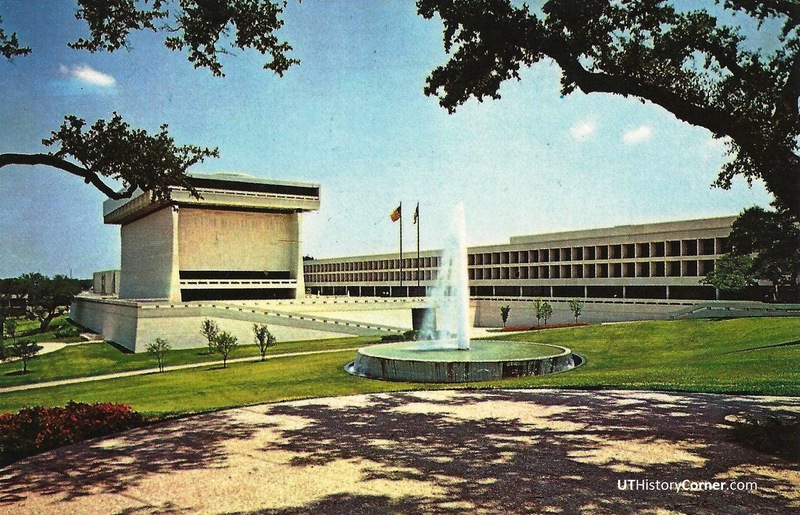 The East Mall and its fountain were part of a 1960 development plan. 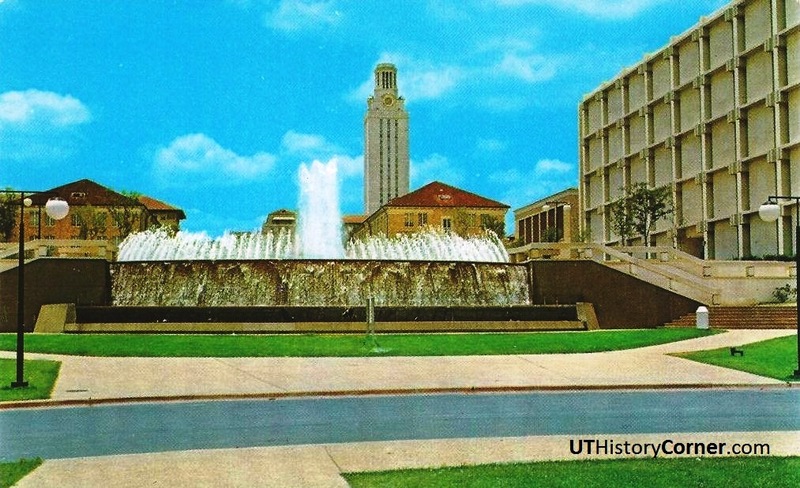 In the late 1960s, during the Vietnam War, students informally dubbed the fountain “Peace Fountain.” On the right side of the image is the geology department building, finished in 1967. It’s been expanded and is now headquarters for the Jackson School of Geosciences. 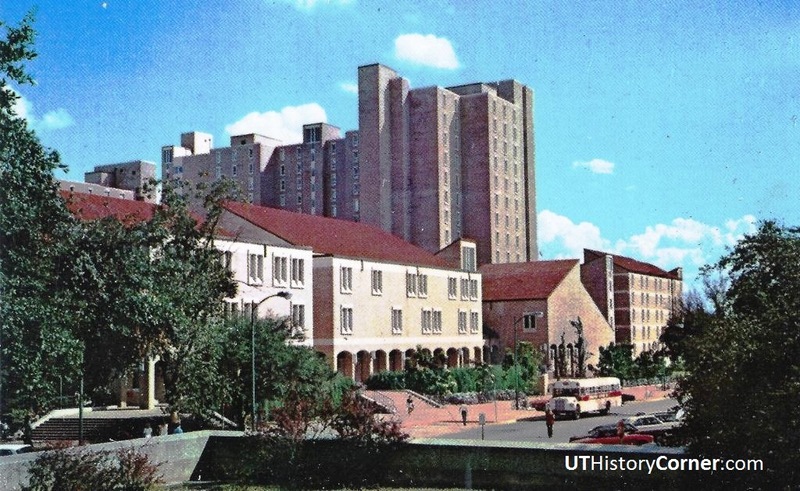 Looking up at Bellmont Hall from Waller Creek in the mid-1970s. Bellmont Hall, named for Theo Bellmont, UT’s first athletic director, was constructed in 1970 both as a classroom building and to add 15,000 seats to the stadium. This is a view of campus from Bellmont Hall, photographed in the 1970s. The building in the forefront on the right is Russell Steindam Hall – the ROTC building and the firing range. It has since been replaced by the larger Liberal Arts Building (which is also a new home for UT’s ROTC programs), opened in 2012. 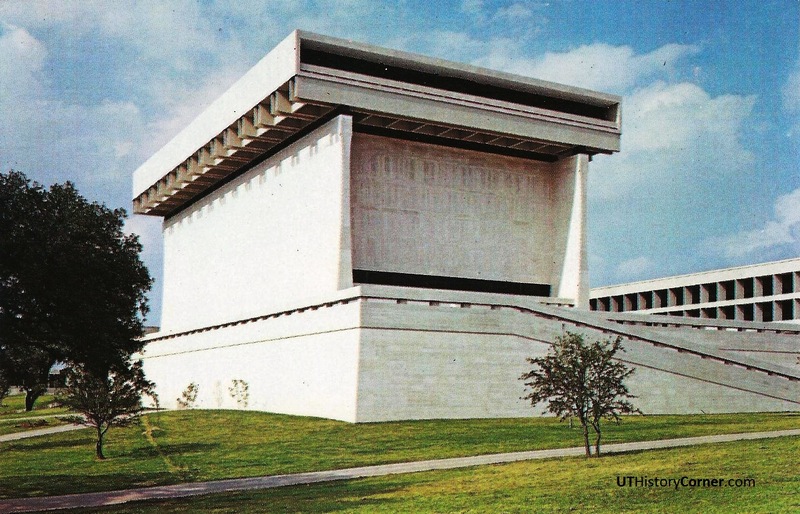 Dedicated in 1971 with a nationally televised ceremony, the Lyndon Baines Johnson Presidential Library and Museum was the first such library to be located on a university campus.